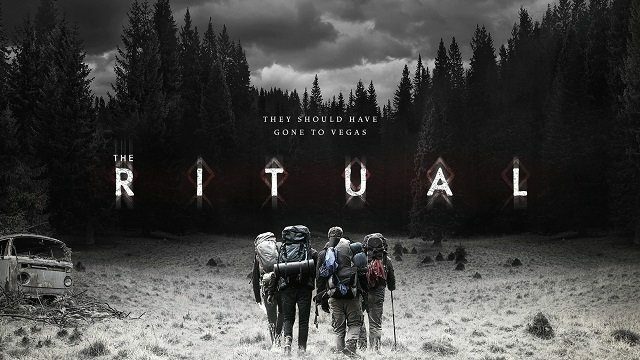 The Ritual is a Netflix movie that will totally surpass your expectations, probably because it’s based on a book. Books, after all, do seem to be a positive influence on cinema, and that’s where The Ritual has much to offer. It builds on the book by taking the monster and plugging it into Norse mythology. The devil is only in the details as much as the viewers read into them, which ends up being a sword with two edges. The cultural tie-ins don’t hold up under scrutiny, but it’s a monster movie that takes the genre to the next level. The film starts with a man being murdered during a heist gone wrong and then jumps six months into the future with Luke, the main character, and his friends on a hike to commemorate their fallen brother; the viewers had so little time with the fallen and no reason to invest in him, so the start is a little slow, but after that it’s on like Donkey Kong. You should stop reading, if you prefer a spoiler-free review, and watch it now. The film is about escapism in its many forms. While the friends are scared, nightmared, harassed, and ensnared throughout the movie, they are running from the same things together, but not in a cohesive group. The Ritual is a Netflix movie that will totally surpass your expectations, probably because it’s based on a book. Luke is the failure-to-launch trope that has come to define so much of the shrinking middle class. While his friends have all moved on from college to pursue family and careers, Luke is without big plans for either. He wants to keep drinking, which leads to his friend’s murder. Phil has no family, and really nothing in his head as far as the movie lets on, and he falls to possession early to be killed later. Hutch has a big family and is a good guy. His mediocre performance as a leader and a friend fells him. Last, there is Dom; whiny and codependent, you know he’s not going to make it by his dorky glasses. Why does any of this matter? Because the monster is judging each of them. So, this silent weighing of character has to make a vague sort of sense—they define the motivations and intentions for the monster. And that’s really where the film wobbles, in its monster ambiguity, and it’s too bad considering how great the monster looks. In the end, it’s up to the viewer to care enough to find out that the book the movie was based on contained a monster derived from a Lovecraft creation, while the movie draws from Norse mythology. The Norse myth is that the gods would send a being to present those enduring terrible suffering with two choices of escape: 1) worship the being and live forever without pain or 2) die and pass on to the afterlife. The Ritual wouldn’t be a monster movie’s version of psychological thriller without terror, but this throws off the choice that Luke is given at the end. The Ritual doesn’t suss out if the monster is a god of grief or fear or some mixture of bad feelings. Luke is escaping a god of the forest that preys on travelers, keeping the strongest to worship it while hanging the rest from the trees like a shrike. Luke overcomes his grief and fear and returns to the world. The others were deemed unworthy without explanation, which makes the story MacGuffin-driven—escape—not character-driven (sorry, Ebert). The Ritual is an excellent monster movie but leaves too much obscure to outgrow the confines of survival horror. What audiences will appreciate is that it goes to the brink, and with a stunning monster.